This week’s “minorities in cartoons” entry is one I should’ve written sooner, but finally have gotten around to: President Barack Obama. The United States’ first non-Caucasian president has certainly had a big media splash since winning the presidency in 2008. As a subject in cartoons, there was some debate early on about how to caricature Obama, given he’s not as easy a target as Bush before him. There’s also cartoonists wanting to avoid any cartoon shortcuts/cliches that might seem like stereotypes of African-Americans. Most cartoonists seem to have gone for merely exaggerating the size of Obama’s ears. A Washington Post blog entry from the 2012 campaign lists various political cartoonists’ takes on how they portray Obama. Since 2008, Obama’s been all over the place in comic strips and books. Obama having stated he likes superhero comics, particularly Spider-Man, probably helped partially fuel this trend. A semi-popular trend in comics over the past few years has been to show Obama on the cover of a comic to boost sales. Although previous comics have had characters meet the president (Superman met JFK in the 60s), Obama must take the record for number of appearances by a living president. Wikipedia has a list of Obama-in-comics appearances, but I’ll go over some of the more interesting ones. 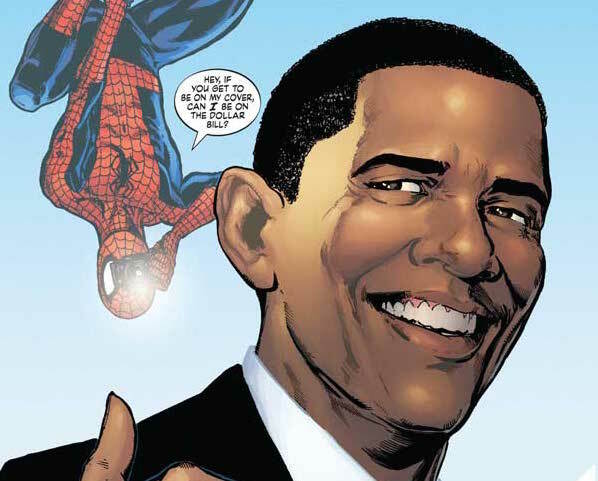 The most high profile appearance might’ve been Obama meeting (and fist-bumping with) Spider-Man himself, on the cover of “Amazing Spider-Man” #583 (January 2009), which came out in time for the 2009 inauguration. In the story, Spidey saves Obama from being replaced by old Spider-Man foe the Chameleon (who’s a master of disguise). Archie’s made several uses of Obama on their covers, including a storyline in which Obama and Sarah Palin both visit Riverdale to meet the Archie gang (who’re running a campaign for student president that somehow gets out of control). One of the covers parodies the classic “Superman vs. the Amazing Spider-Man” crossover’s cover. Oddly, DC’s probably the one company that hasn’t used Obama for a cover to my knowledge. Granted, DC does deviate from the real-world president when it suits them. Examples include showing a generic figure as president, or the Lex Luthor-as-prez storyline in the early 2000s. Still, Grant Morrison’s run on Superman has resulted in a story in “Action Comics” #9 (in 2012) where the parallel Earth of “Earth-23” is visited. There, we see the President of the United States is an Obama-like person who happens to be from that universe’s Krypton (and functions as the Superman of Earth-23). Outside of the “New 52” line, the “DC Super Friends” comic featured in issue #17 (September 2009) the team visiting the White House and meeting President Obama. Flash is excited about getting to meet the president. Meanwhile, Obama compliments Green Lantern (John Stewart) on his haircut. Meanwhile, long-running comic strip “Doonesbury” hasn’t even tried to portray Obama as one of its now-classic “icon” portrayals of the president (such as a floating waffle for Clinton, or a floating cowboy hat/Roman centurion helmet for the second Bush). Instead, cartoonist Garry Trudeau seems to have reverted to the “talking White House” portrayal of the president, as he used for the pre-Reagan strips. In animation, Obama’s appearances seem fewer (as far as I can tell). However, the usual adult-oriented animation (Fox’s Sunday night lineup, “South Park,” etc.) has mentioned or shown Obama at some point. Obama appeared as president at the end of the “Batman: The Brave and the Bold” episode “Cry Freedom Fighters,” where Plastic Man, portrayed here as much dumber than he usually is in other appearances, doesn’t recognize him. A far cry from Jack Cole’s Plas, who worked for the FBI. Most modern versions of Plas seem to depict him as the “wacky” one, presumably to get Plas to fit into the same universe as Batman.